Many of our stories this month pick up on the theme of entrapment in its various forms. Meanwhile, David Edgerley Gates offers a perplexing procedural as Montana Deputy Hector Moody returns in “Crow Moon” to solve a case involving a drunken Vietnam Vet with a broken neck. A copy editor in Julie Tollefson’s “Abundance of Patience” revisits her career and the newspaper industry in light of massive layoffs. And finally, John Gregory Betancourt brings a “new” Mystery Classic to our attention: James Holding’s “The Norwegian Apple Mystery” featuring sleuth Leroy King. 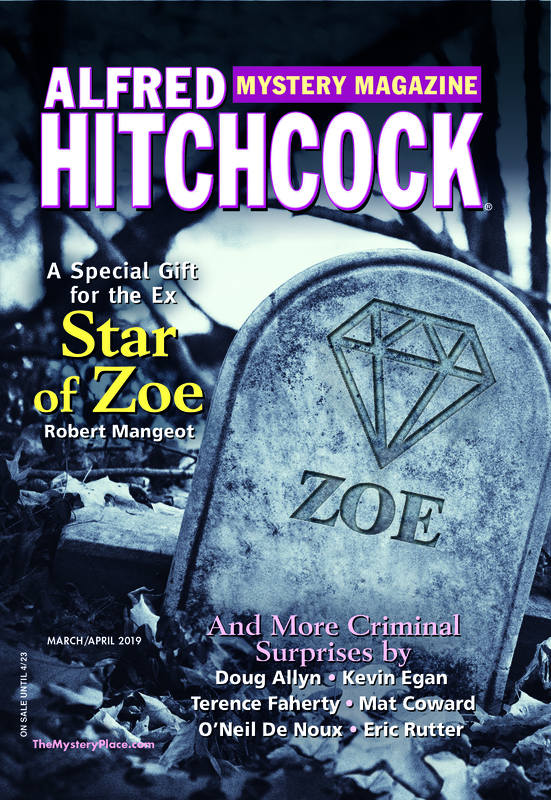 There’s no escaping the great fiction in our March issue: Once you start reading, you’ll be hooked. Mystery stories are often driven by people in dire straits—such as an accountant standing on a skyscraper ledge, waving a pistol. That’s the crisis facing Loren D. Estleman’s resourceful Four Horsemen police squad in “Tin Cop.” Meanwhile, broken ex-Wall Streeter Pit Geller finds himself holed up in Las Vegas with a family torn apart by a dead guy in John Gregory Betancourt’s “Pit and the Princess.” Jay Carey imagines policing a future Sarasota, Florida ravaged by global warming, destructive storms, and crumbling infrastructure in “We Are Not Insured Against Murder.” A literary publisher finds himself at the end of a rope—specifically, a noose—in John C. Boland’s “The Man Who Stole Trocchi.” A curious “curator” roaming Europe is unaware of the wolves at his heels in Stephen Ross’s “Gallery of the Dead.” And B. K. Stevens closes out her long-running series featuring Lieutenant Walt Johnson and Sergeant Gordon Bolt this month in “True Enough: Bolt’s Last Case.” To mark this transition, watch this blog space for the author’s reflections on her decision to say goodbye to one series and start another. Plus we bring you a bit of espionage when radio producer Margo Banning visits a munitions factory in “Margo and the Locked Room” by Terence Faherty. John H. Dirckx, well known to AHMM readers for his Cyrus Auburn procedurals, translates and introduces this month’s Mystery Classic, “Justice by the Book” by Pedro de Alarcón. Finally, Robert C. Hahn introduces us to a new crop of bibliomysteries in his Booked & Printed column.